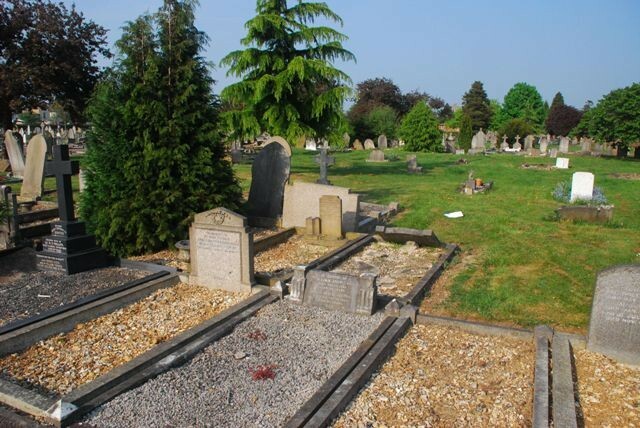 Tearle Family history in Watford, Hertfordshire. 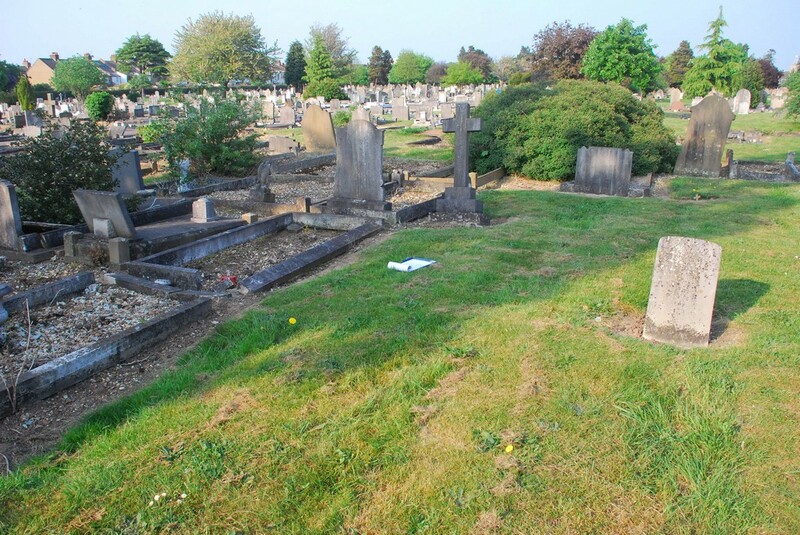 Elaine and I visited the Vicarage Rd Cemetery in Watford on 24 Apr 2011, armed with a printout of Tearle names and grave numbers given to Iris Adams and me by the warden of Watford North Cemetery when we went looking for Tearle graves there a couple of years previously. At Watford North, we had found Reginald Frank Tearle. 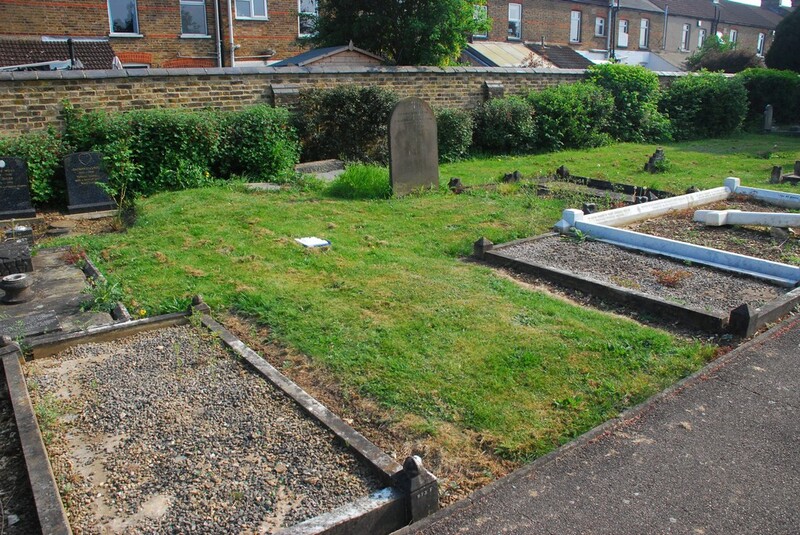 To start with, the Vicarage Rd Cemetery is pretty big. Without a map, it would be almost impossible to find any particular grave, and even with a map, the layout is somewhat chaotic, due mostly, I should think, to the number of times it has been enlarged, and re-numbered. 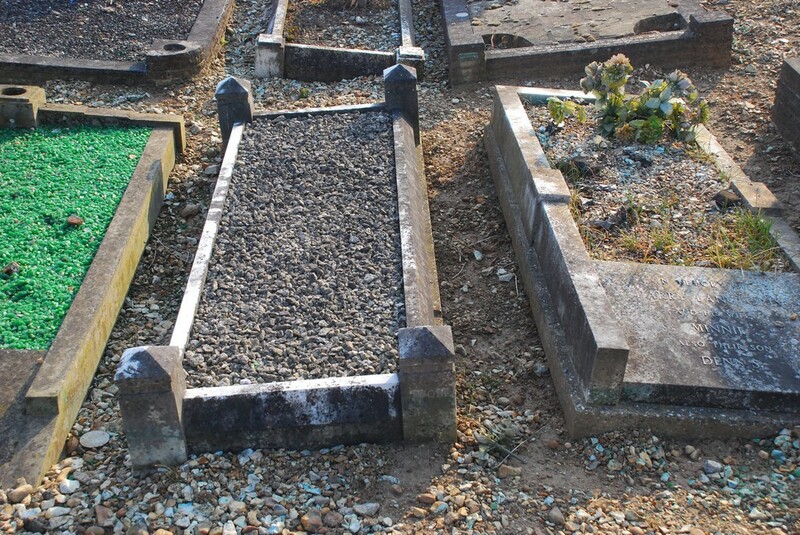 One of the saddest things was that some of our earliest graves, and therefore the most important, had been re-used, and if there had ever been a headstone, it was now long gone. The only clue was in the catalogue number of the particular site. 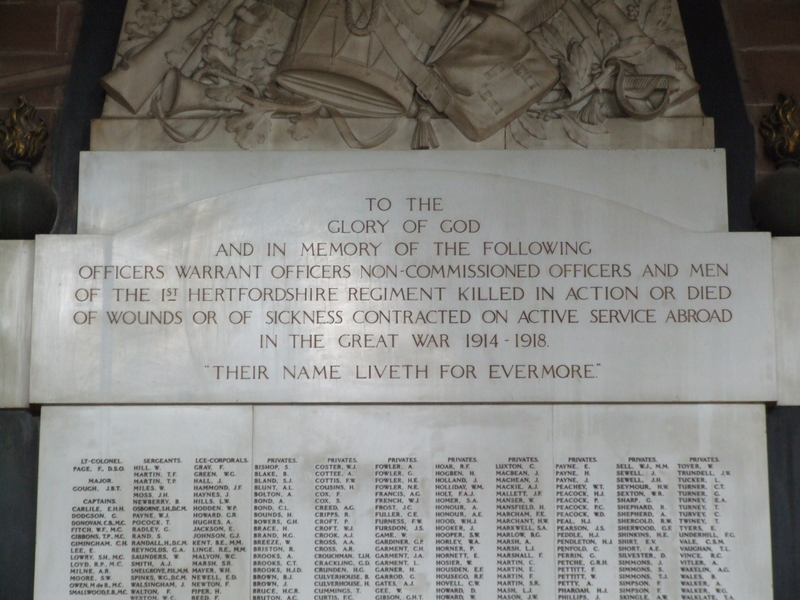 There was a WW1 Great Cross close to the main entrance, and visible from Vicarage Rd as you drive past the Watford football stadium, to indicate that there were CWGC headstones in the cemetery, but there was no enclosure of a group; the headstones were wherever you could find them. 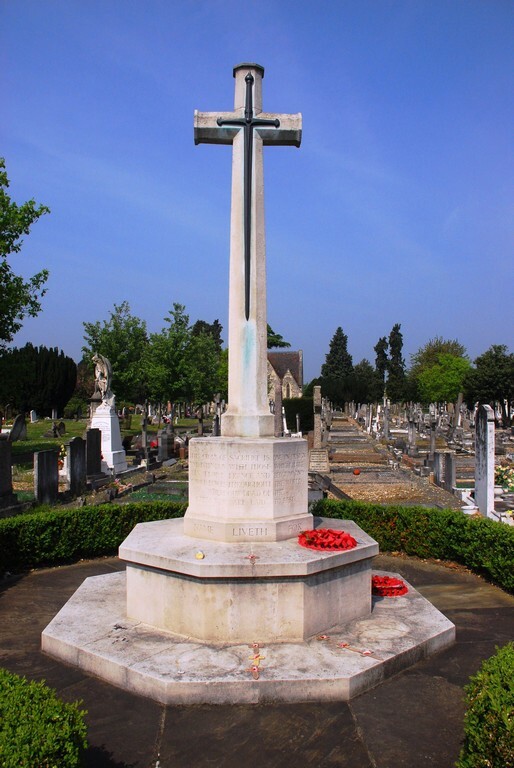 Vicarage Rd Cemetery War Memorial, Watford. We paid our respects at the War Memorial, took our list of grave numbers and gradually found them all. 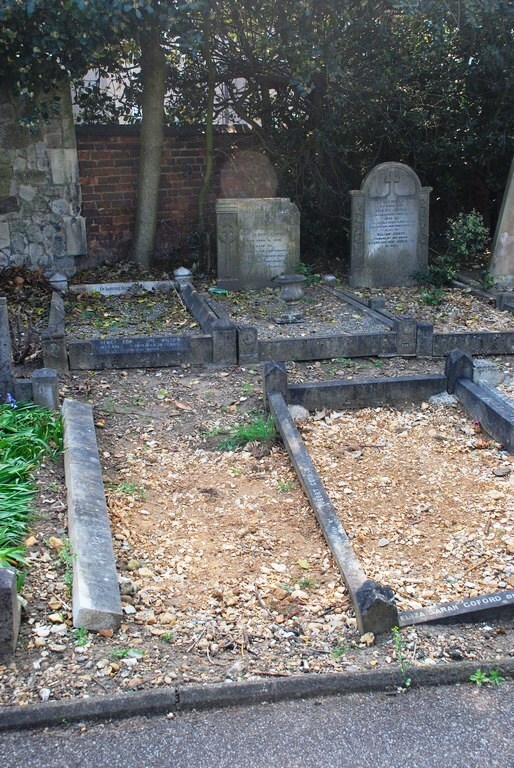 The triangle in the lower foreground is grave D-DED 441, for Charles Tearle b/d1879. The headstone on the left of the picture was also placed in 1879. Charles was the infant son of Jabez 1844 and Susannah nee Payne. Grave D-DED441 the triangle Charles Tearle d1879 Vicarage Rd Cemetery. Tearle Corner, Vicarage Rd Cemetery, Watford. 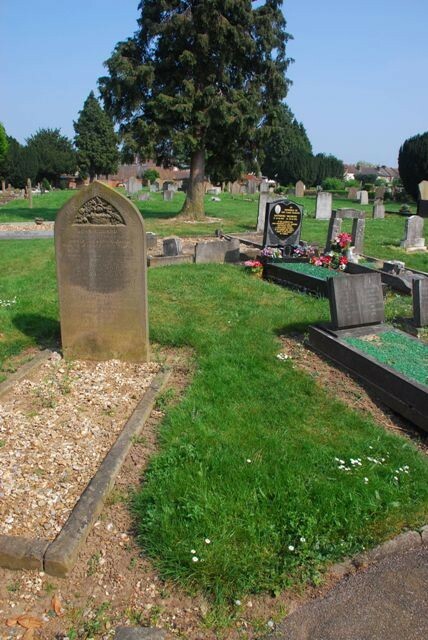 Tearle Corner grave K953: George 1902-1931, Edward Joseph T 1874-1933 and Jane nee Picton – Vicarage Rd Cemetery, Watford. 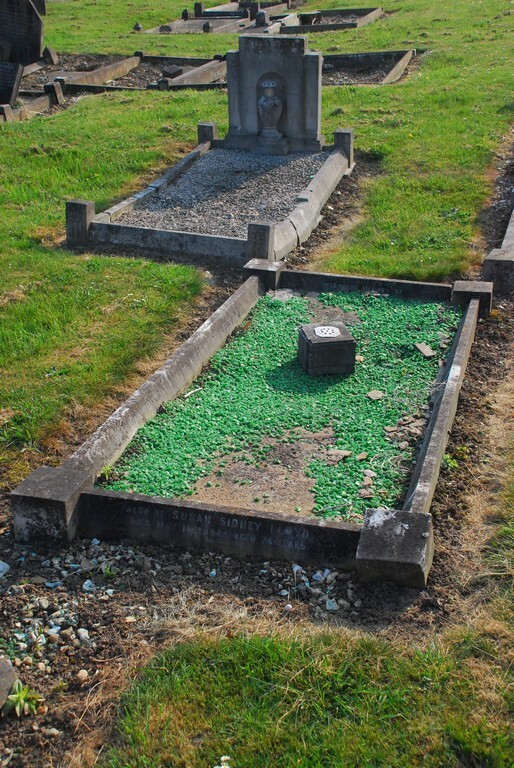 Tearle Corner headstone K953 – George 1902-1931, Edward Joseph T 1874-1933 and Jane nee Picton. Vicarage Rd Cemetery, Watford. Tearle Corner grave K862 William Tearle 1852-1913, Vicarage Rd Cemetery, Watford. Tearle Corner grave K862 William and K861 Mabel Tearle 1884-1955 Elizabeth Strickland 1821-1903 Elizabeth Louise Tearle 1852-1924 George 1854-1945. Vicarage Rd Cemetery, Watford. 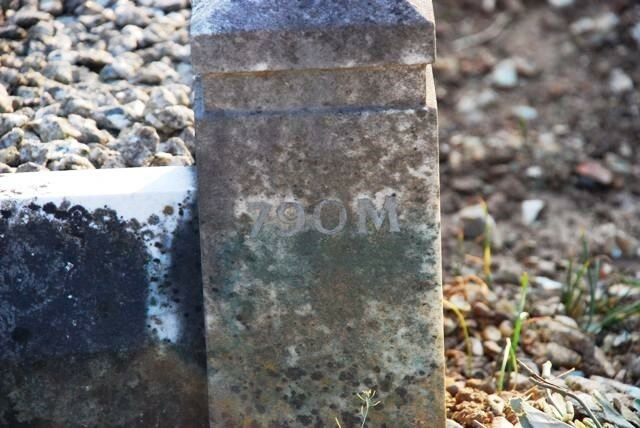 When you are given a printout of the grave numbers for a person, or number of people, there is also a rather vague map of the general locations (eg K) but the only way to tell where you are is to refer to the grave numbers, such as is shown here. 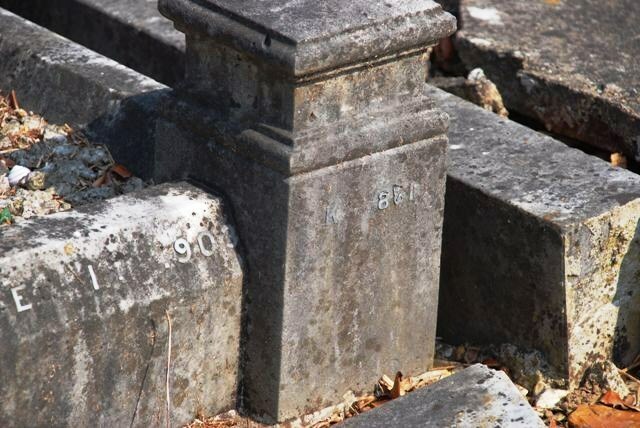 How to tell the exact grave number. Elizabeth Louise (as here, or Louisa, sometimes) 1852-1954 was a London girl from Stepney, who married George 1854 in St Pancras in 1879. 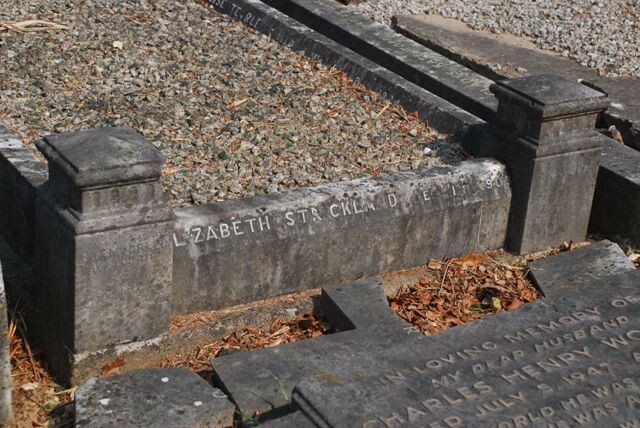 E-CON 76, the grave for Sarah Ann 1851, Elizabeth Amelia 1821, George 1818, Jabez 1844 and Lucy 1857; potentially the most important grave of all. 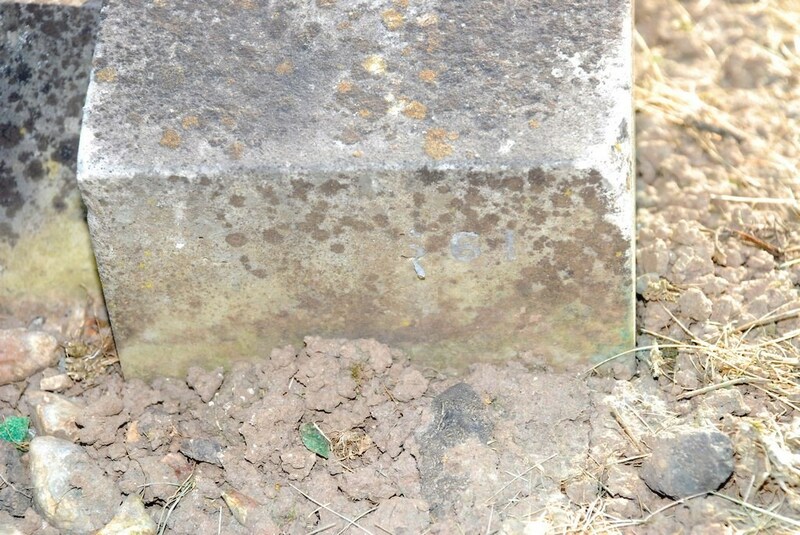 It probably never had a headstone, and you can see that, sadly, the site is re-used. 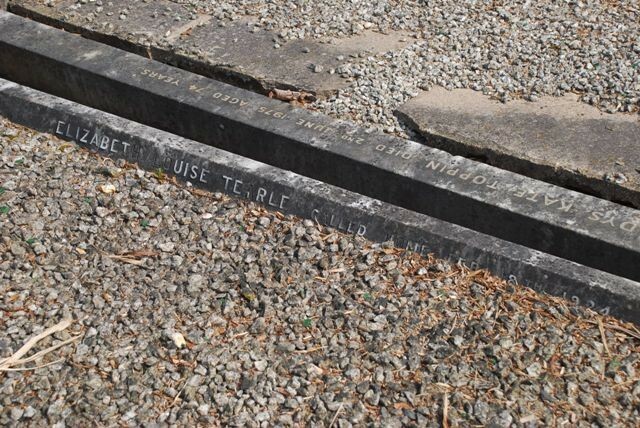 E-CON76 – grave for Sarah Ann 1851 Elizabeth Amelia 1821 George 1818 Jabez 1844 Lucy 1857 reused. 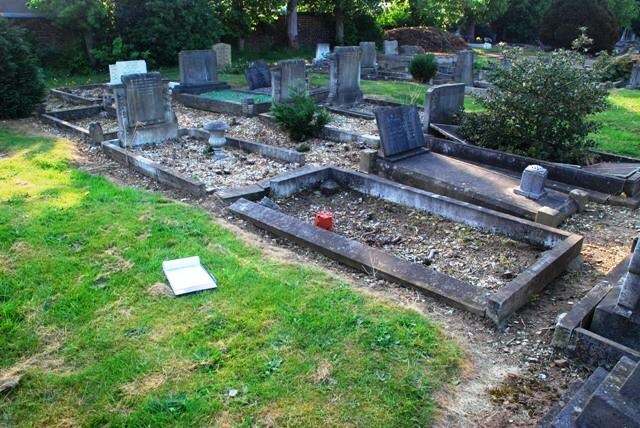 E-DED441 Albert Edward Tearle 1906-1907 unmarked grave Vicarage Rd Cemetery Watford. F974 Alice Mary Tearle 1868-1917. Vicarage Rd Cemetery, Watford. 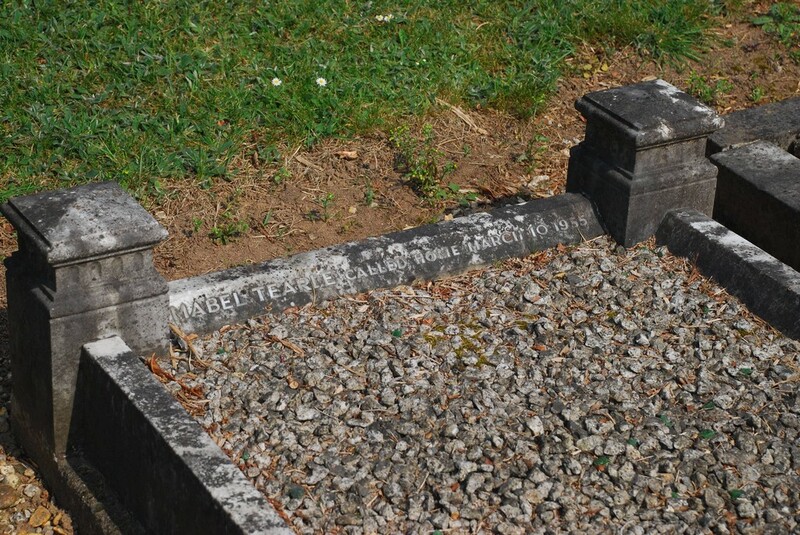 F892 Thomas Tearle 1847-1925 and Mary nee Bowler. Vicarage Rd Cemetery, Watford. 615 H-CON (Below) Arthur Fred Elliott Tearle 1877-1948, Florence Mary 1905-1907 and Annie nee Hodges 1872-1954. Arthur is a son of Thomas 1847 and Mary nee Bowler, so he is the brother of Alice Mary, above. 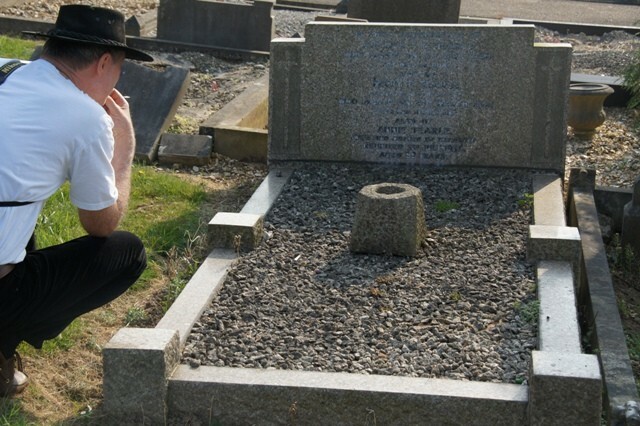 615 H-CON Ewart studies the grave of Alfred, Florence Mary Tearle and Annie nee Hodges. 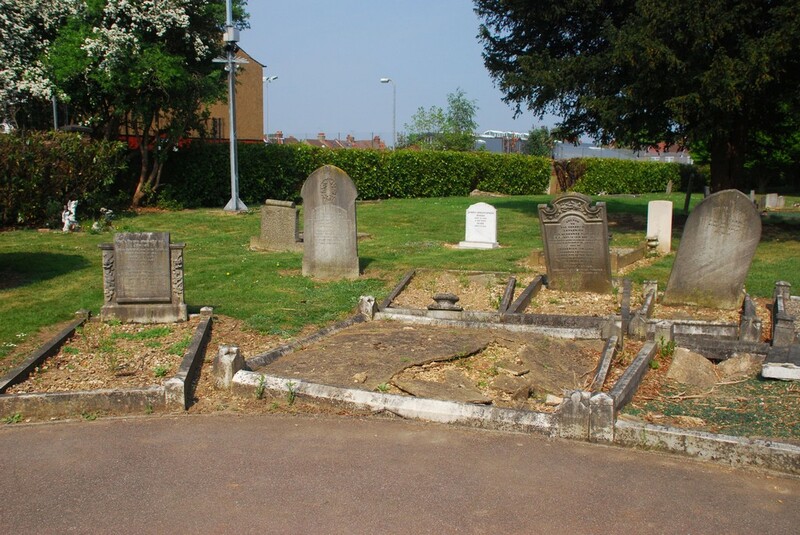 Vicarage Rd Cemetery Watford. 615H-CON Photo to show the location for the grave of Arthur F E Tearle 1877-1948 Florence Mary 1905-1907 and Annie nee Hodges 1872-1954. Vicarage Rd Cemetery, Watford. 561-L Mildred Annie Tearle 1884-1908. 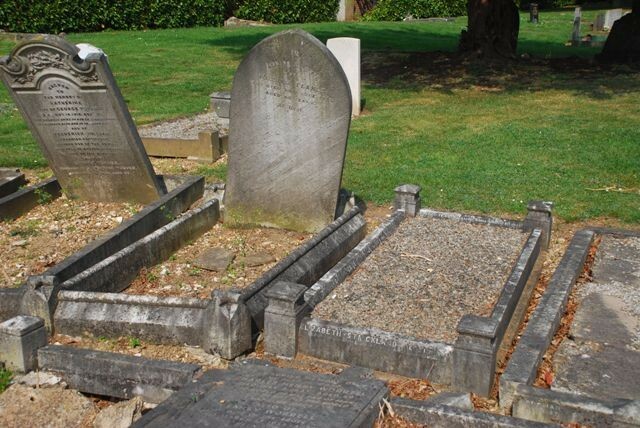 Unfortunately, this grave, too has been re-occupied and Mildred Annie’s name is no longer on it. Mildred was the daughter of Anne Elizabeth Tearle 1859 before Anne Elizabeth married Joseph Moore in 1888. 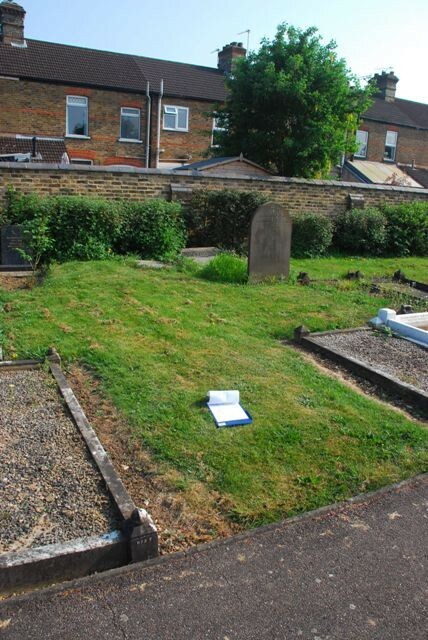 561-L – Foreground, reused grave of Mildred Annie Tearle 1884-1908 Vicarage Rd Cemetery, Watford. 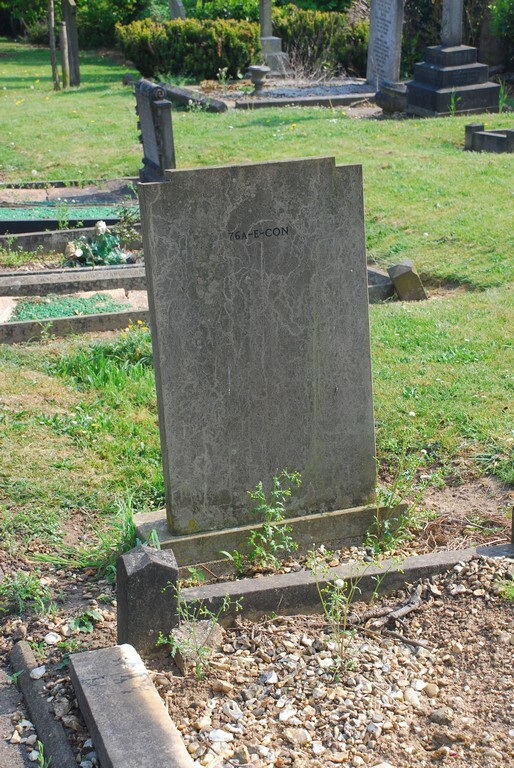 Below is a picture of plot 1150 L-CON for William 1857-1933. The clipboard marks the site. William married Mary Jewell nee Trust nee Cox. He was the son of Abel 1833 and Sarah nee Davis, so he was the brother of Ann Elizabeth 1859, and Mildred Annie’s uncle. Joseph 1737. 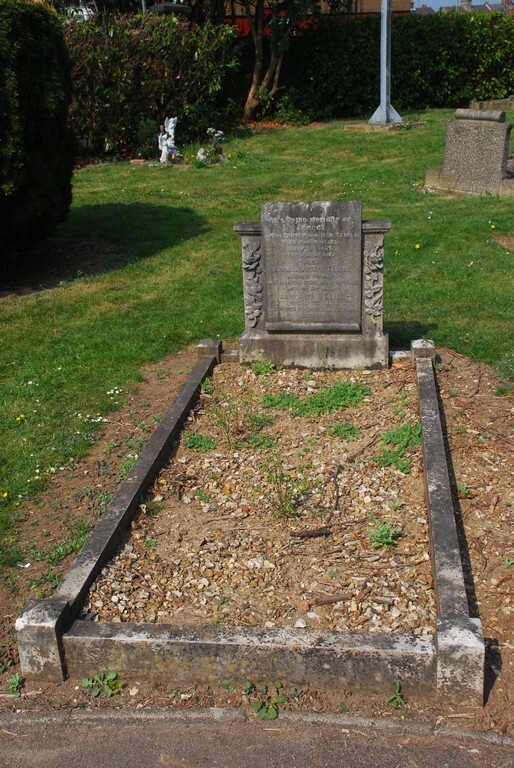 Grass plot 1150L-CON William 1857-1933. Vicarage Rd Cemetery, Watford. 790M corner post for Olive Archdeacon Tearle 1881-1985. Vicarage Rd Cemetery, Watford. 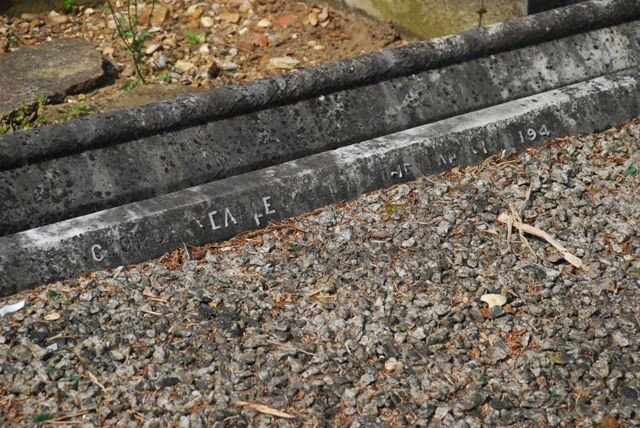 Reused grave 790M for Olive Archdeacon Tearle 1881-1985. Vicarage Rd Cemetery, Watford. John 1780 and Sarah nee Claridge, whose children were all born in Leighton Buzzard. John was a member of the 2nd Dragoon Guards and father to a line of theatrical Tearles one of whom was Sir Godfrey Tearle, the movie and Shakespearean actor. He was also the father of many sons who joined the Royal Marines – at least four that I know of. Thomas 1847, the railway engine driver, married Mary Bowler. Their daughter is Alice Mary 1868 and their son is Arthur Fred Elliott T 1877. He married Annie Hodges and their daughter Florence Mary 1905 is featured on their headstone. Joseph 1737 and Phoebe nee Capp. Their grandson Joseph 1769 and their gg-gson William 1857. Joseph 1797 and Maria nee Millings. Joseph was the son of William 1769 and Sarah nee Clark, and grandson of Joseph 1737. Mildred Annie 1884 is their grand-daughter, the daughter of Ann Elizabeth 1859 and grand-daughter of Abel 1833 (and Sarah nee Davis) who was a son of Joseph 1797 and Maria nee Millings. Annotated by Ewart Tearle, Apr 2011. Thanks to Rosemary Tearle of Auckland, New Zealand. Sun Engraving and Sun Printers was a large printing company in Watford in the 20th Century. Here is their company history page and the link below is to a list of employees. I have extracted the Tearle names from this list and attempted to identify them from the information already held in the Tree. The annotation is beneath the company listing, in italics. 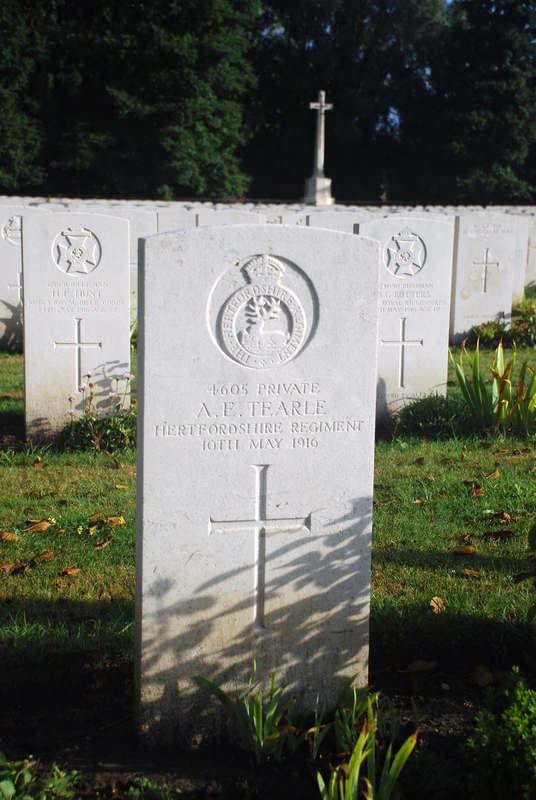 Herbert Lewis Tearle, Sgt, Royal Engineers. I can find no further information on the military service of these two men, but WW2 service is no small thing. Anne Tearle 1944 Watford, dau Donald Edward T 1922 and Roma Monica nee Braham. G-grandson of Jabez 1844 and Susannah nee Payne. Antony E Tearle 1951 of Watford, son of Donald Edward Tearle 1922 and Roma Monica nee Braham. David Philip Tearle 1909 of St Albans, son of Edward Joseph Tearle 1879 and Emma Elizabeth nee Warner. Brother of Leslie James 1896 who was killed in France 1915. Donald Edward Tearle 1922 of Watford, son of Edward George Tearle 1898 and Nellie E nee Boultwood. Grandson of Edward Joseph 1874 and Jane nee Picton. Herbert Lewis (aka Lewis Herbert) Tearle 1912 of Watford. Grandson of Levi 1852 and Jane nee Packard. Married Freda M Minter. I have been having a look at the Alf Tearle of Watford correspondence of December 2006, as a result of an enquiry by Ian Tearle. In 1901, Alfred George (who was 29, a carpenter) and Minnie were living at 29 Sutton Rd, Watford. The whole family is recorded as having been born in Watford. 1901 = Alfred G 1872 Watford Minnie 29 Beatrice 7 Gertrude 5 Alfred E 3 Alice 2 Rosie 2m Susannah mother wid 60 John L bro 24 Samuel H bro 19 in Watford. Sadly, young Alfred E, the 3-year-old above, would enlist for WW1 and be killed. As you can see, living with them are Alfred’s mother, Susannah and his brothers John Leonard 1876 Watford and Samuel Haws 1882 Watford. Although the birth registration of Samuel has him as Howes, the correct spelling is Haws. The name comes from his grandmother, Annie Haws 1819 of Dagnall, who was the wife of George 1818 of Dagnall. Alfred’s parents were Jabez Tearle 1844 of Borehamwood and Susannah nee Payne. In 1891, the family is living in 12 Elury (I cannot make it out properly) Rd, Watford. Susannah is already a widow and she is working as a laundress. Alfred is a carpenter’s apprentice, Edward is a stonemason’s apprentice and young John is an errand boy. In 1881 we find out that Jabez 1841 of Borehamwood is the father of this family. This famous name – quite numerous amongst the Tearles – was first used for Jabez 1745 of Stanbridge, one of the family of Thomas 1710 and Mary nee Sibley. He never married nor had children, but he seems to have been very well-known amongst his extended family and his name is perpetuated throughout the 19th Century Tearles. Mind you, it’s not so uncommon as names go: 1500 Jabez were married between 1881 and 1891 in England. Jabez is a brewers labourer and the family is living at 23 Albert St Watford. Jabez and Susannah are in Watford for the 1871 census. He is a brewers labourer, she is a dressmaker and they are living in Birches Lane, Watford. I assume he says he was born in Elstree because in the 1851 census, when Jabez was 6yrs, George and Ann were living in Elstree. Here are Jabez and Susannah getting married. 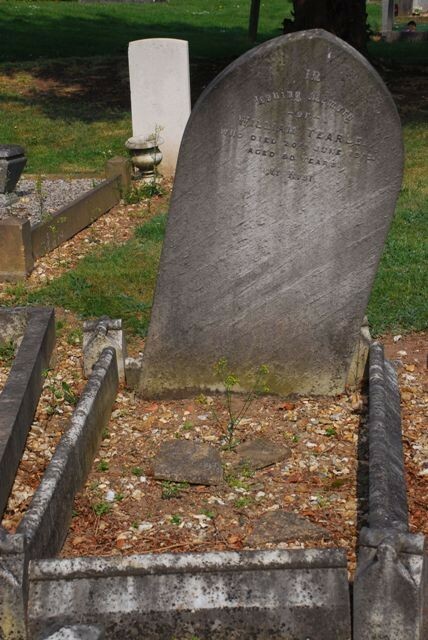 Which brings us back to Jabez’ parents, George 1818 of Dagnall and Annie nee Haws, whose youngest son William Haws Tearle 1858 of Borehamwood, went off to Australia and started the families of the Australian Tearles. George’s parents were Abel 1797 of Edlesborough and Hannah nee Frost. And Abel’s mother was the famous Fanny Tearle 1780. Grave/Memorial Reference: III. R. 8. His parents were Alfred George Tearle 1872 Watford and Minnie M nee Cyster. His grandparents were Jabez 1844 Borehamwood and Susannah nee Payne. Jabez’ parents were George 1818 of Dagnall and Annie nee Haws, who founded an Australian family. George’s parents were Able 1797 Edlesborough and Hannah nee Frost, and of course, this Able was the son of the famous Fanny 1780, possibly the daughter of Thomas 1737 Stanbridge and Susannah nee Attwell. So that makes Alfred a member of the branch Thomas 1737. 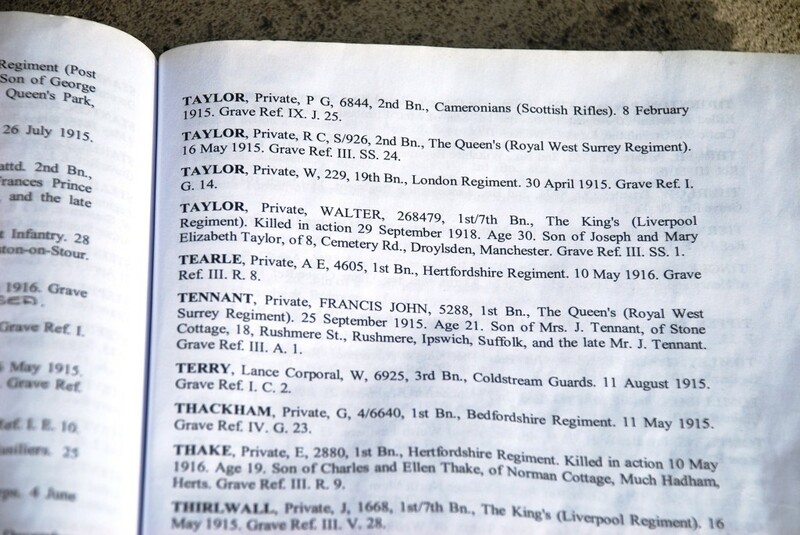 I note from the Hertford site that the 1st Bn in 19 August 1915 was transferred to 6th Brigade, 2nd Division, and on 29 June 1916 was transferred to 118th Brigade, 39th Division. 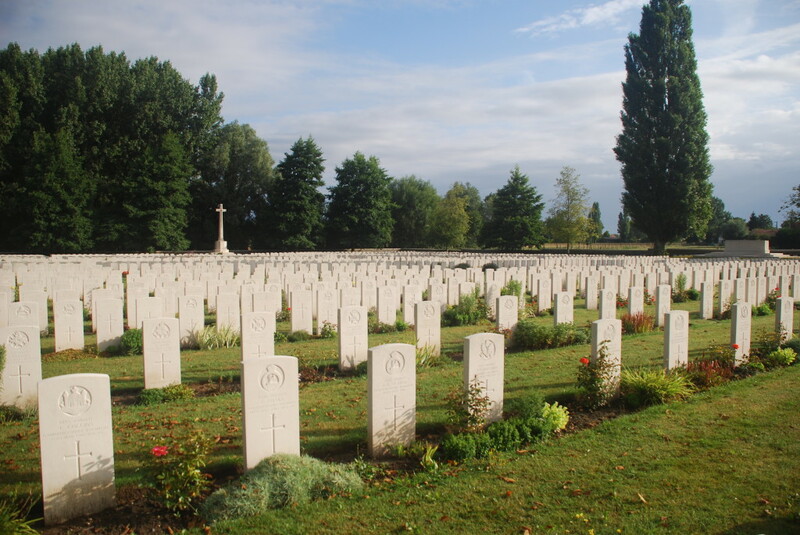 Since Alfred was killed on 10 June 1916, he was never in the 39th Division. If you look up the activities of the 2nd Division, the poor chap never stood a chance of lasting the war. It looks as though he was killed between Loos and La Bassée during the battle of Loos. His Army record of gratuities to his family shows only that he was killed “In Action”, and that two small gratuities were sent to his sister. 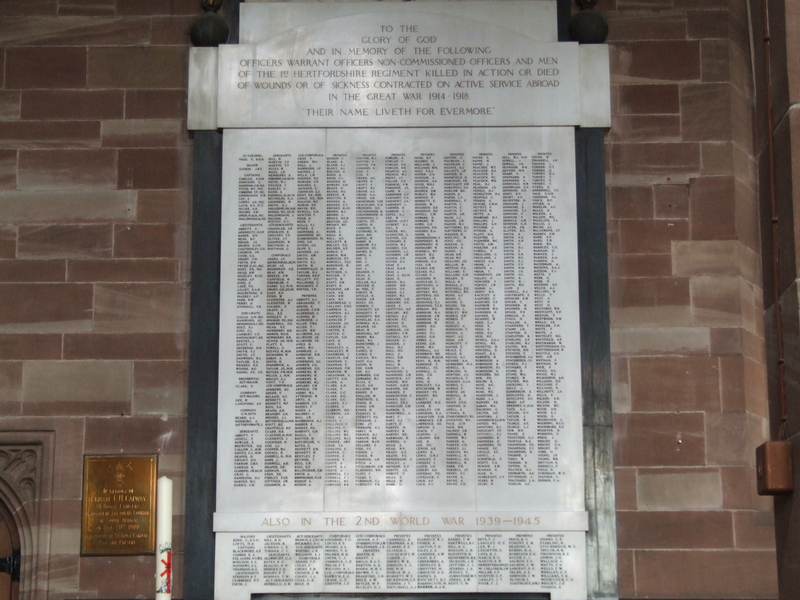 Alfred Edward is remembered on the War Memorial in All Saints Church, Hertford. War Memorial, All Saints, Hertford. War Memorial header, All Saints, Hertford. 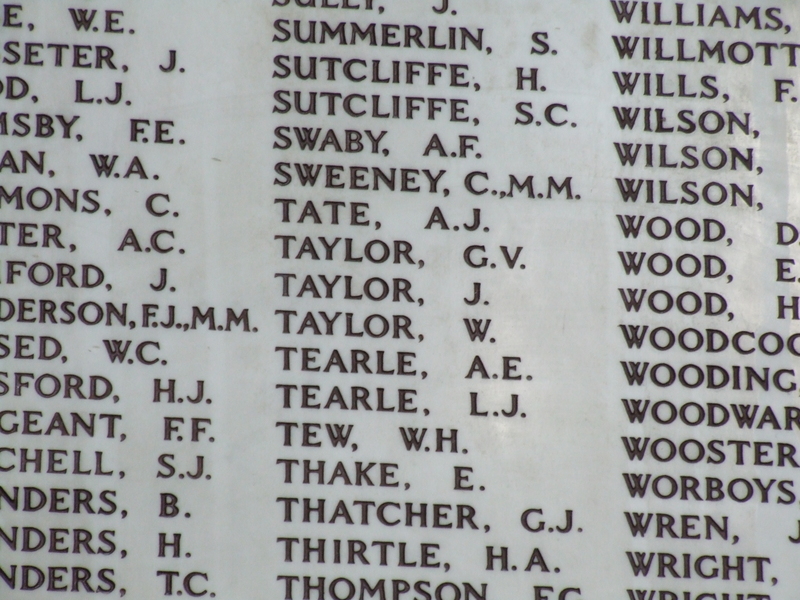 WW1 memorial names E A Tearle L J Tearle in All Saints Church, Hertford. 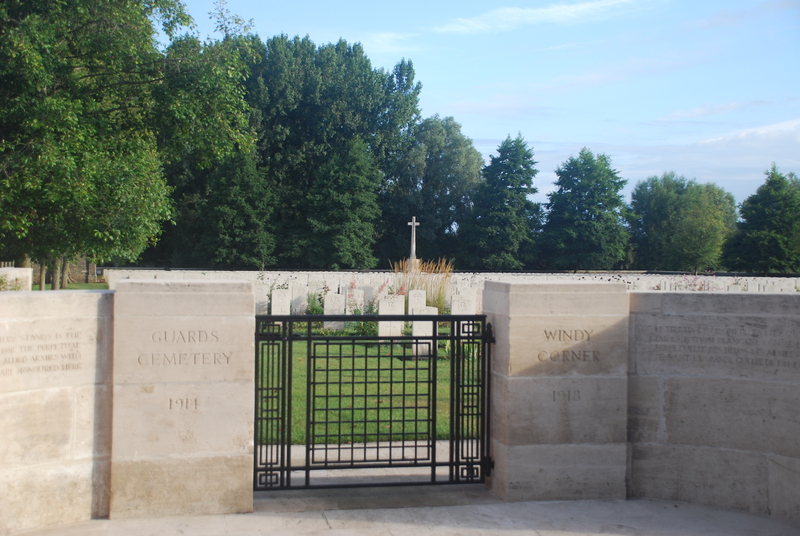 The gate – Guards Cemetery, Windy Corner, Cuinchy. The massed graves of Windy Corner, Cuinchy. 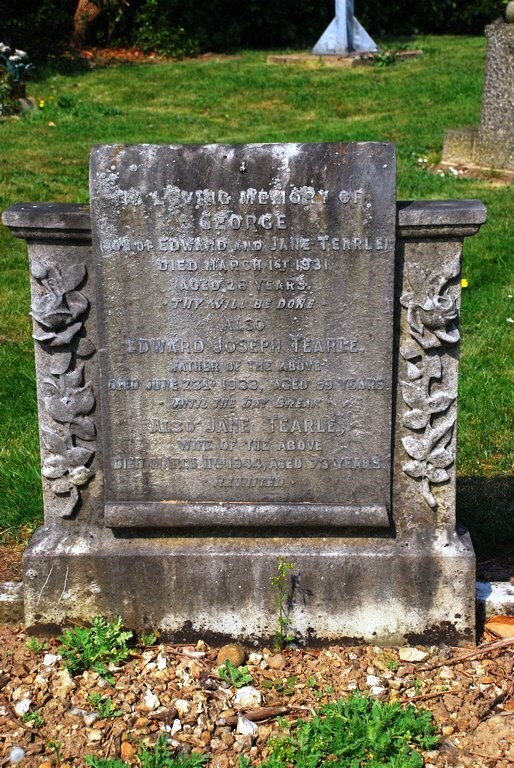 Alfred Edward Tearle headstone in Windy Corner, Cuinchy. Alfred Edward Tearle in the Book of Remembrance, Windy Corner, Cuinchy.